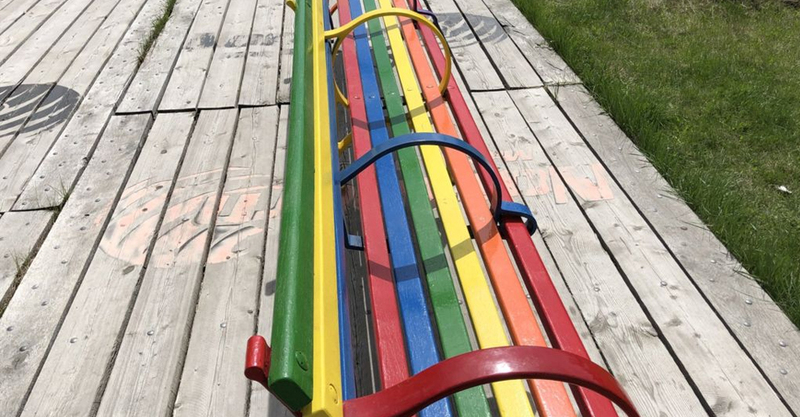 A picture of a rainbow-coloured bench has launched a debate about homelessness, exclusion and hostile design on social media.On Saturday, Twitter user Isaac Azuelos posted an image of a bench in his hometown of Calgary, Canada.The bench featured metal bars which prevent homeless people from sleeping there.Mr Azuelos’ tweet was widely shared and other users posted their own examples, some using the hashtag #HostileDesign. “These are designed specifically to prevent tired people from laying down on them,” wrote Twitter user @ThisMicah. “It’s a feature, not a bug,” the tweet continued. “I think the problem is that society tells them they’re a problem and shuns them from public spaces,” wrote another. “But that doesn’t solve the issue, [it] just pushes it out of sight. Maybe by treating homeless people like humans they can actually progress rather than be a ‘problem’.” But others questioned why people should be allowed to sleep on public benches. Meanwhile some pointed out that bars can provide support and assistance to the elderly or less physically able.Ever thought about old people who need something to hold onto to get up and down?” asked one. The debate has captured the interest of many. Mr Azuelos’ original tweet has generated significant discussion online and tens of thousands of likes and retweets. British artist Stuart Semple in February, he set up a website to document what he describes as “designs against humanity” after seeing benches fitted with “anti-homeless” bars in Bournemouth, Dorset. He posted an image of one of the benches to Facebook in January which, he claims, was viewed more than a million times inside 24 hours. Bournemouth council officials later announced that all bars would be removed following protests.